Sea ice is more complicated than you might think. It's not solid. It's much more like a sponge, shot through with tiny channels and pores that can contain salt, briny sea water, or air bubbles. That structure matters in the event of an oil spill. Oil is lighter than seawater so if it is spilled, it can migrate upward, into the tiny channels in the ice, which can trap it and complicate clean up. But the truth is that Arctic sea ice is so complex that it is difficult to know exactly how oil and ice will interact. Studying it is also difficult because traditional sampling and tests may crush or distort the very structure you're trying to understand, says Sönke Maus, a postdoc at the Norwegian University of Science and Technology. and a member of an international research group called MOSIDEO (Microscale interaction of oil with sea ice for detection and environmental risk management in sustainable operations). "We are looking at channels that are one-tenth of a millimeter in diameter," Maus said. 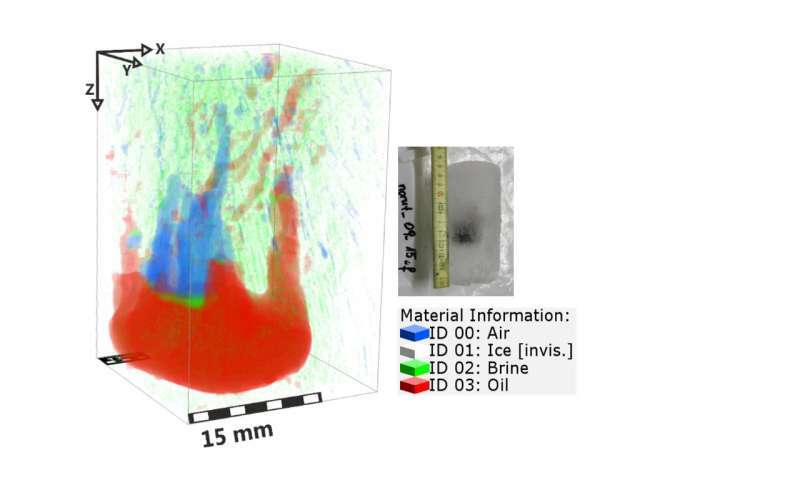 "And if we want to know what is happening in the ice, we need a three dimensional image." Here's how Maus describes the problem: if crude oil is spilled in the ocean, it normally floats. But if the oil is released or spilled under a lid of sea ice, it will be trapped under the ice. "Depending on the microstructure of the sea ice, the oil may be trapped or it may keep moving up towards the surface," he said. "So if we want to evaluate the environmental consequences of an under-ice oil spill, we really want to know when and if the oil will come to the surface, how far the ice will drift before the oil surfaces, and how much of the oil will be trapped in the ice when the ice finally melts." If that doesn't sound difficult enough, there are even more challenging questions that have to be answered to figure out how to deal with an oil spill, Maus says. First, remember that sea ice is more like a sponge than a solid substance. The channels and pores in the sea ice are different depending upon where they are located in the ice. At its surface, where the ice is in contact with cold air temperatures, sea ice has smaller and less connected pores. Maus says that oil will normally only enter larger pores and also needs to push the seawater out of the pores. During wintertime the ice is often too cold at the surface to allow for this, and the oil will be trapped. But during spring, or when the ice warms in warm weather, oil may migrate to the surface. Once the oil surfaces, "you have to act very fast," Maus says. "The only realistic approach to remove this oil from the surface of a closed ice cover is to burn it. However, most of the oil can only be burned during a window of opportunity of typically one week." After a week, the oil is said to be "weathered". It has lost certain components and mixed with water and can no longer be removed by burning it. "This oil then threatens the arctic ecosystem," Maus says. Maus and his colleagues, including Martina Lan Salomon, a MOSIDEO Ph.D. candidate, are perfecting the use of x-ray microtomography to study the ice, with the ultimate goal of addressing all these unknowns so they can better predict what will happen to oil spills in the Arctic. The main goal of MOSIDEO, which includes researchers from NORUT, the Northern Research Institute, NORUT Narvik, NTNU and the University of Alaska, is to learn more about the interactions between oil and sea ice. The researchers hope their work will improve risk assessment and contingency planning for oil spills. It is funded through the end of 2018 by the Research Council of Norway. The approach the researchers are using relies on a higher resolution version of the technology that allows your doctor to create a CT scan image. Essentially, the researchers create a series of consecutive two-dimensional images of a sea ice sample while it is rotating. This produces thousands of 2-D transmission images that can be used to reconstruct the internal structure of the sea ice. A reconstruction made using a powerful mathematical algorithm, transforms these images into a range of grey values that reflect different material densities for ice, brine, salt crystals and air. ). In practice the 3-d image, typically 2000 x 2000 x 2000 "voxels," or the 3-D equivalent of a pixel, is often stored as a stack of 2-d slices. "Fifteen years ago you would need a super computer to do this," Maus said. "But now we can analyse a 30 gigabyte image using a good graphics card and good software." The researchers also have access to a CT scanner at the university via RECX, the Norwegian Centre for X-ray diffraction, scattering and imaging (recx.no). Salomon's Ph.D. is being sponsored by a German software company called Math2Market, which makes the software the scientists are using to analyse their icy images. But imagery and software are just the tip of the iceberg, so to speak. To study sea ice, you have to have sea ice, and to study oil spills in sea ice, you have to create some oil spills. Maus and Salomon are tackling this problem in two ways. The first is to run their oil spill experiments in an ice basin in Hamburg, Germany, called the HSVA, or the Hamburg Ship Model Basin. Here, they can control conditions as they develop their study approach. They freeze a series of long cardboard tubes in the ice, like the same kind you might use to store a map or poster. They can then introduce oil into the bottom of all of the tubes. Each day, they take a sample from a new tube see how the oil moves from day to day. Experimental sea ice is good, of course, but even better is to see what happens out in the real world. 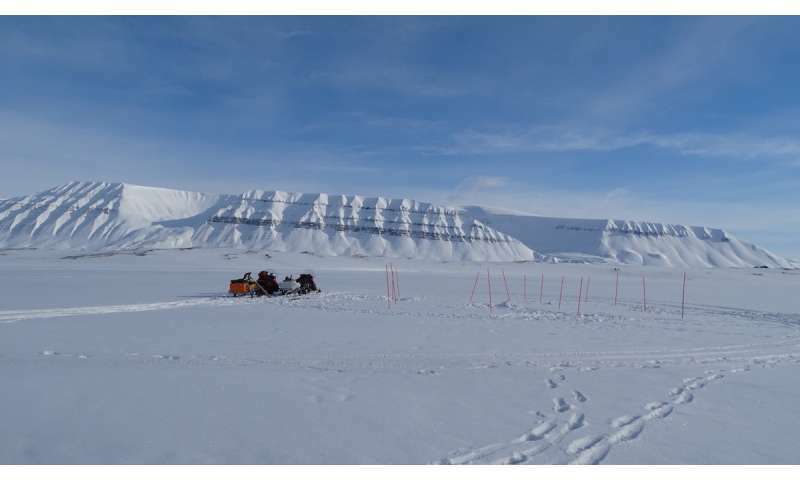 To do this, the researchers have traveled to the Norwegian island archipelago of Svalbard, where they drive snowmobiles from the main town of Longyearbyen to a little outpost called Svea, about two hours away. In the winter and spring of 2016, Salomon and Maus froze 15 cardboard tubes in the sea ice outside of Svea, and got permission from the Svalbard authorities to create their own mini (and carefully controlled) oil spill, by introducing oil and diesel into the tubes. Once a week, they returned to Svea to sample the tubes, which allowed them to see how the oil moved upwards, and how the microstructure of the ice changed over time. Salomon can take the samples back to the laboratory at UNIS, the University Centre in Svalbard, and centrifuge the oil free samples to remove all the sea water. She can then create x-ray microtomography images of the sea ice to compare it to microstructures of sea ice with introduced oil. 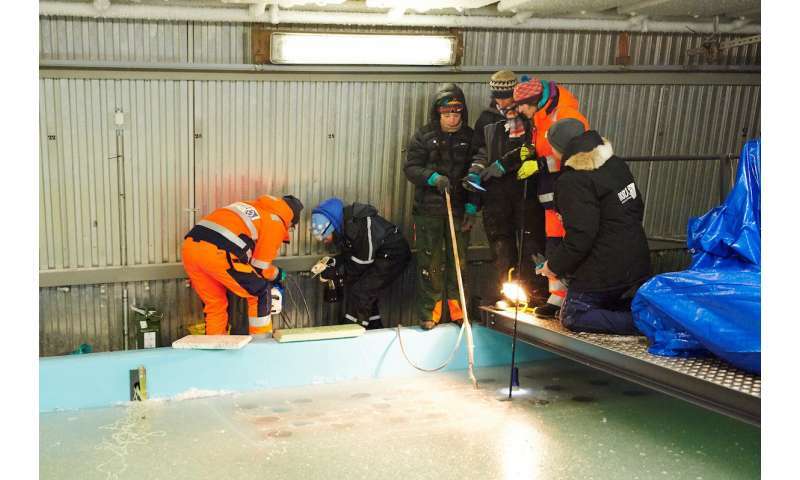 The ice has to be kept at the correct temperature to preserve the structures inside it—which itself is another challenge if the researchers have to transport the ice to mainland Norway, or to Germany, where they had access to a special facility that was much faster and could product better image quality. So far, the use of special frozen blocks—the "blue ice" that people may use in their picnic basket to keep perishable food cold—works well. In Svalbard, where the air temperature is actually much colder than the sea ice, the researchers have the opposite problem. "We don't want the ice to be too cool," Maus said. "So we have special insulated boxes that we can heat to the right temperature while we drive back from Svea to Longyearbyen." For the moment, the two researchers are still perfecting their imaging techniques and building computer models that will help them describe the structure of sea ice down to its smallest pores. The next step is to use this information to help predict how the oil will move in the ice, Maus said. "In case of a serious oil spill in the Arctic, the results of our project will be important to minimize the harm to the environment," Maus said. But the structure of sea ice has importance far beyond oil spills, as scientists strive to understand climate change, Arctic ecosystems and develop a more substantial information base for Arctic engineering, he said. "It's an important step in understanding porous sea ice which covers, on average, 5-7 percent of the world oceans, and plays a key role in determining the Earth's climate and environment in cold regions," he said.